Residents of Redlands, CA, have plenty of reasons be looking for car storage. For some, a classic car that brings back fond childhood memories just doesn’t fit in the family garage. Others may need a place to store an extra car while a family member serves in the military or until a teenager is ready to drive it. Still others may be looking for a location where they can give a luxury vehicle the maintenance and care that it needs between drives. Spacious units – Our units vary so you can be sure to get the size you need. If you’re simply parking the car between trips, a small unit might work best. If you’ll be cleaning, waxing, or performing any service on the vehicle, a larger unit will give you more room to move around and store any necessary supplies. Protection from weather – Left outside, even a covered car, is at some risk of damage due to weather like rain, wind, hail, or dust. If you’re not driving your car in these elements, consider whether you want the vehicle to face them while sitting in your driveway. Protection from the sun – Even in the best of climates, there is still a risk to your vehicle from the sun, which can fade or damage the paint of the car. Additionally, heat can impact the life of your tires. Parking the car indoors will protect the vehicle from the sunlight. Barrier to insects or rodents – The outdoors is full of little critters looking for a place to rest, or nest. A parked car provides a number of great hiding spots for rodents and insects. Security – Keeping your car protected from the elements is one thing, keeping it safe from theft or damage is another. Indoor storage units that are locked and located within a secure facility gives you peace of mind. The experts at Vines Storage can help you find the perfect storage unit to meet your vehicle storage needs. With our convenient location, extended hours, 24-7 security and surveillance, and amenities, we offer clients everything they need to store their car, recreational vehicle, boat, or personal items. 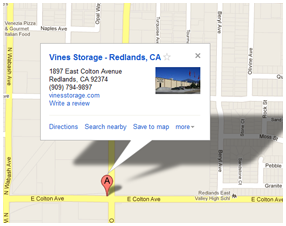 For more information about our storage solutions in Redlands, CA, call Vines Storage today.